Refined and contemporary, with two faces that display two time zones and a complete calendar. 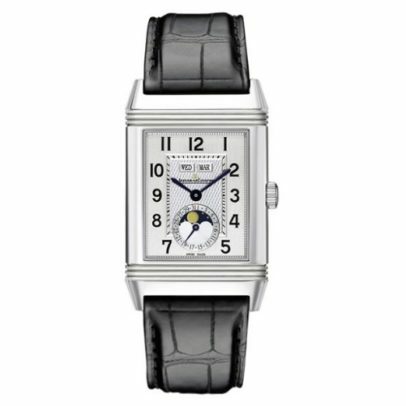 The subtly grained dial on the back adopts the features of the 1931 model with faceted applied hour markers. It showcases a complete calendar comprising the day and month in two apertures, and the date and moon phases in the display at 6 o'clock. In a testament to the pure watchmaking sophistication of this timepiece, the moon phases have been hand-hammered by Jaeger‑LeCoultre's craftsmen for a textured result that conjures a perfect representation of the moon.